Application resilience is the ability of an application to react to problems in one of its components and still provide the best possible service. Resiliency has become more important as organizations continue to rapidly implement software across multi-tier, multiple technology infrastructures. Is your development team delivering code with sufficient resiliency to minimize failures? Are hidden systems vulnerabilities affecting application resiliency? Application resilience testing or non-functional testing is important to making certain every component within an infrastructure provides the utmost performance and reliability. Why Test for Application Resiliency? As your organization implements multi-tier systems consisting of several applications and technologies, it is common for vulnerabilities or availability issues between tiers to surface. Automated application resiliency testing offers a dependable method for assessing software while providing measurements to evaluate system performance, architecture standards, and stability as software is rapidly developed or updated. CAST Application Intelligence Platform (AIP) is a system-level architecture and code analysis solution that can be used to perform application resiliency testing on large, complex, and multi-technology systems. AIP analyzes source code and architecture to identify vulnerabilities and verify architecture or coding standards adherence. This creates a bottom-up view of software risks and real-time information for remediation or software quality improvement. 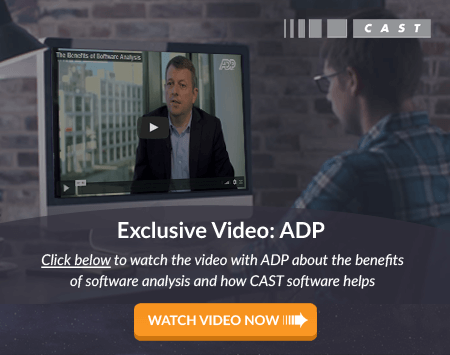 CAST AIP is the only enterprise platform capable of analyzing code quality and architecture standards, regardless of the language, to provide development process improvement opportunities. It can analyze every major technology stack to identify code level problems capable of affecting your entire infrastructure. If your organization is experiencing reduced application resiliency due to poor productivity, insufficient code quality, missed vulnerabilities, or an inability to meet architecture standards, contact us today to learn more about the benefits of using AIP to perform an accurate, repeatable analysis.